We want to congratulate Blake McNamara on signing with Wheelock College. 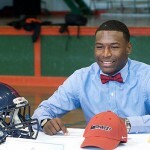 Here is Blake’s recruiting story and interview from after he committed. We wish Blake the best as a Wheelock Wildcat! 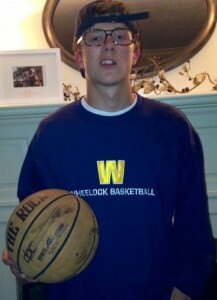 On April 29, I committed to Wheelock College. I phoned the coach and infomed him of my decision. The process was exciting. I really enjoyed conversing with College coaches and recruiter (asst. Coaches). I went on several visits to different schools to get a feel for the campus, the coaches, etc. each time my family and I were invited to watch the team play. That piece gave me a real good idea of what type of players the coaches recruit as well as the coaching styles. I choose Wheelock because their collegiate Basketball program is top notch. What I mean by that is the Coach LeVangie is great, he truly invests himself in each player and took a great deal of time to meet with myself and my family. Coach LeVangie meets with players once per week to check in on their academic load and how it’s going, he looks out for his team and it is a comforting to know he has your back. The campus is nice and right in the heart of Boston, it is in the “Fenway Five” district (5 area colleges in the consortium). SportsForce was instrumental in getting my video and portfolio out to college coaches. 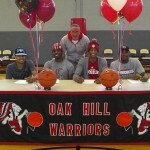 They assisted me every step of the way, with making the video, providing guidelines for my initial and consequent contact with college coaches, offered advice for my college visits and meetings with coaches. SportsForce was great! Get your emails out early to college coaches, contact as many coaches as possible. Some colleges that I added to my list later in the year meant that the deadline to apply to the school had passed. Send emails early and leave enough time to visit the school and apply. Many deadlines for applications are the beginning of Jan or Feb. I am very excited to take my basketball career to the next step and play at the collegiate level. This is something that every boy dreams of and now my dream has come true, with a lot of hard work and help from SportsForce!!! I am not exactly sure how much money I saved as a result of basketball but my parents estimate it to be around $35,000 – $40,000 (over the 4 years). The money at Division III does not come directly from athletic funds or scholarships but is rolled into the financial aid package. I would recommend SportsForce to any high school athlete who has the desire to play ball at the collegiate level. They are helpful in a variety of ways and the money you put into the program comes back around, for just under $500 my family is saving an upward of $35,000 and to play ball at the collegiate level……PRICELESS!!! However, once you do, it will be one of the most rewarding decisions you make in your entire life! You’ll need to consider everything from athletics, academics and location to the financial costs and social atmosphere of each school. All this criteria goes into creating your college target list and what you and your family should consider when making a decision before you even contact a school. All these tools are in our College Recruiting Resources Section. EXAMPLE CASE: Let’s say you’re a student who has a 3.0 GPA and a 1400 SAT score. Those are solid marks, but not in the upper ranks for academics. Likely, that student-athlete and family shouldn’t target Ivy League schools or schools like Stanford or UCLA on the West Coast. Rather, you should do some research and determine what schools are a better fit for you both athletically and academically. There are some great websites like collegeboard.com that can help you determine what schools might be a great fit for you to attend. Keep in mind if you are being actively recruited, you don’t have to have the same grades that are required for the listed academic requirements for most schools. Athletically, the best thing you can do is to go out and see a college team play, or watch them on TV to see the caliber of play and if you are capable of developing into that caliber an athlete. Visiting the athletic website for each college is a must as well. – Take note of what the backgrounds of the players are. Were they All-League in high school? All-County or All-State? Remember, it’s great to dream and have a vision for your career, but it’s also important to be realistic and use your time wisely when you’re looking at the college decision and college recruiting process.